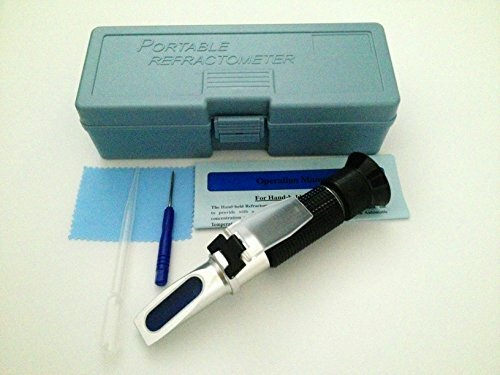 BRAND NEW (0-32% Brix scale) Hand Held Refractometer. This unit is great for the testing of Fruits, Vegetables and Grasses, Wine or Beer makers and for the maintenance of CNC Coolants (Soluble Oils, Semi-Synthetics, Neo-Synthetics and Synthetics) and Water Soluble Drawing & Stamping Compounds. Fruits, Vegetables and Grasses: This unit will help you monitor the sugar levels of your crops, plants and trees. A valuable tool to help determine if it's the right time for harvest or you need to alter your plant food. Take this item with you to your local farmer's market and buy the best quality! Check out our Garlic Press to help aid in juice extraction! Metalworking Fluids: Help maintain your coolant levels to improve finishes, extend tool lilfe, elongate your coolant life and save you money! Excellent for Soluble Oils, Semi-Synthetics, and Synthetics! This is THE unit that is used around the world at Boeing, Airbus, Ford Motor Company, Toyota, West Coast Choppers and other manufacturer's big and small! We know coolant! Ask us any question! Beer & Wine: Use the Brix readings to get your wort/mash sugars and help to determine your finished alcohol readings (use in conjunction with a hydrometer).